ATLANTA — October 10, 2011 – The man who inspired many of the Porsche race cars that will be on display at the upcoming Porsche Rennsport Reunion IV will be joined by the man who has one of the most significant collections of those cars, as Jerry Seinfeld has been named co-Grand-Marshal with retired Porsche Engineer Norbert Singer. “Norbert Singer is one Porsche’s most brilliant innovators and someone I have always wanted to meet. I am thrilled to join him in Monterey for Rennsport IV as Co-Grand Marshal,” said Seinfeld. 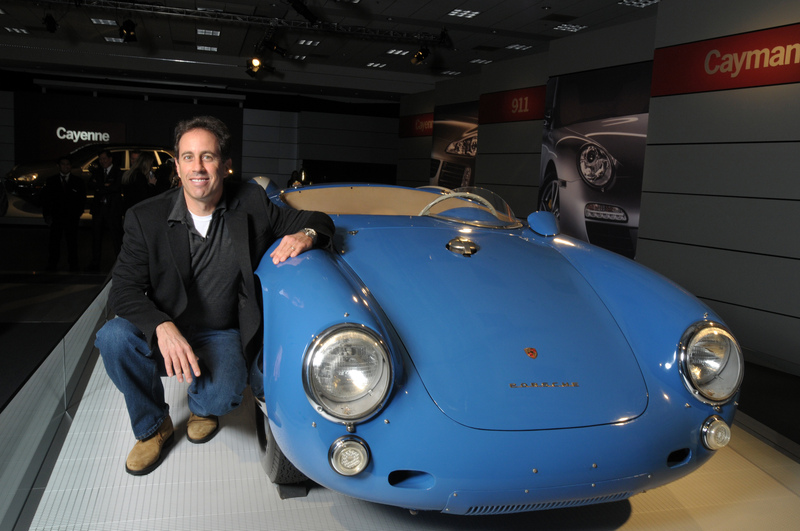 Jerry Seinfeld poses with his 1955 Porsche Spyder, on display at the Porsche exhibit at the Los Angeles Auto Show, where Porsche celebrated the worldwide debut of the new 2009 Boxster and Cayman at a press conference Wednesday afternoon. PHOTO BY Â© AXEL KOESTER, ALL RIGHTS RESERVED, 11/19/08. Seinfeld’s participation is particularly appropriate as Rennsport IV is honoring the Porsche 911. Included in his collection is the first production 911 (1964) and the last production air-cooled 911 – a 1998 993 that he bought from the factory – the last 993 to roll down the assembly line. His collection, a mixture of street cars and race cars, includes a street-version Porsche 959 (not legal to drive in the U.S.) – one of only 200 ever built. Others include the Porsche 917K that Steve McQueen drove in the movie Le Mans, a 1959 straight-16 GT speedster; and a 1955 Spyder 550 — the same model and pearl-grey color actor as the James Dean car. Additional details of the Porsche Rennsport Reunion IV will be published on Porsche’s press web site (press.porsche.com), and Mazda Raceway Laguna Seca’s web site (http://www.mazdaraceway.com), Ticket information is available by contacting 800-327-7322 or online at www.mazdaraceway.com. Porsche Cars North America, Inc. (PCNA), based in Atlanta, Ga. is the exclusive U.S. importer of Porsche sports cars, the Cayenne SUV and Panamera Gran Turismo. Established in 1984, it is a wholly-owned subsidiary of Porsche AG, which is headquartered in Stuttgart, Germany, and employs approximately 220 people who provide parts, service, marketing and training for 196 dealers. They, in turn, work to provide Porsche customers a best-in-class experience that is in keeping with the brand’s 63-year history and leadership in the advancement of vehicle performance, safety and efficiency. 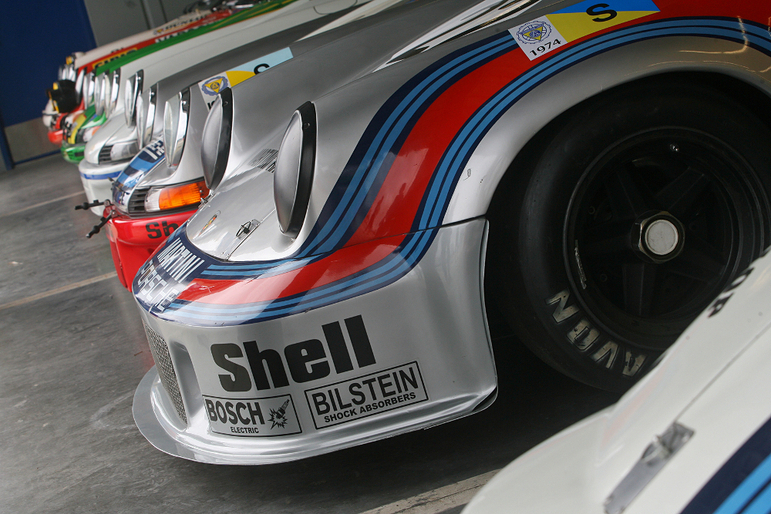 At the core of this success is Porsche’s proud racing heritage that boasts some 30,000 motorsport wins to date. By whatever means available, Porsche loyalists will find their way to Mazda Raceway Laguna Seca October 14-16 for the Porsche Rennsport Reunion IV. The event makes its first West Coast appearance and brings together some of Porsche’s most historic racing models as well as featuring the North American debut of the 2012 Porsche 911. Helicopter flights are available to and from Mazda Raceway Laguna Seca starting at $99 each way or $150 round trip from Monterey Regional Airport. Rates are per person. Charter service is also available with advance reservations from most Bay Area airports including San Jose, San Francisco and Oakland. Specialized Helicopters features a team of dedicated pilots and a fleet of state-of-the-art Robinson helicopters. Please contact Specialized Helicopters at 831-763-2244 or log on to www.specializedheli.com for more information. 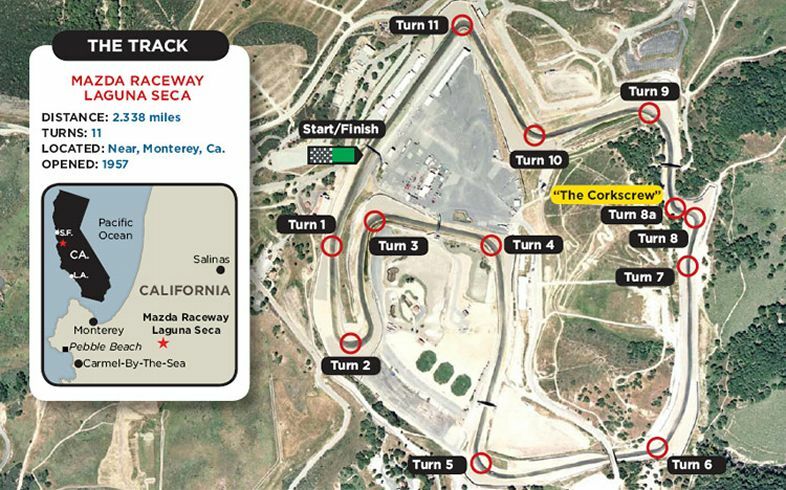 Monterey-Salinas Transit (MST) provides rides from Carmel, Seaside, Monterey and Salinas on lines 36, 37, 38 and 39 respectively, dropping off to Mazda Raceway Laguna Seca. Please visit the MST website www.mst.org or call 1-888-MST-BUS1 for more information. Several entryways will be open allowing for swift arrival and departure. The South Boundary entrance provides an entry/exit point for spectators coming in from Highway 1 from the North. For race fans coming to the track from Salinas and Southern California the Barloy Canyon entrance will be open on Saturday. “While the Rennsport name has become a staple fixture for international collectors and racers over the past ten years, choosing the Monterey Peninsula will open up this one-of-a-kind gathering to the many Porsche fans in California and beyond who were previously unable to attend,” said Detlev von Platen, President and Chief Executive Officer of Porsche Cars North America. Porsche Rennsport Reunion IV will assemble the wide variety of Porsche’s most historic racing models from the nimble 550 Spyder of the mid-Fifties through the mighty 917 and 956/962 of the Seventies and Eighties to the highly successful GT3 RSR. 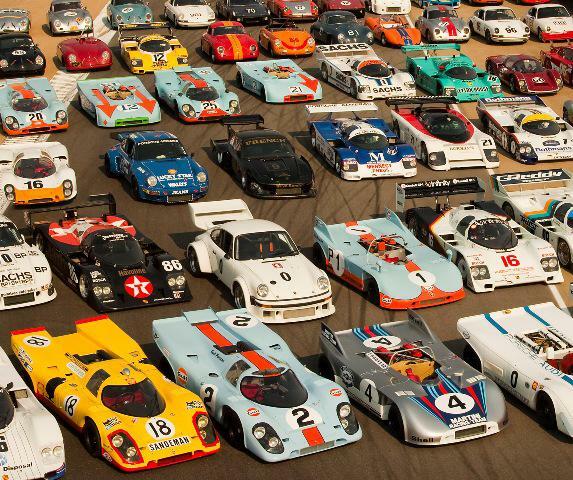 “This will truly be a rare gathering of significant Porsche race cars on the West Coast,” commented Gill Campbell, CEO/general manager of Mazda Raceway Laguna Seca. Complementing the Rennsport Reunion IV venue is the Porsche Race Car Classic, an exclusive concours held at nearby Quail Lodge in Carmel on Sunday, October 16. 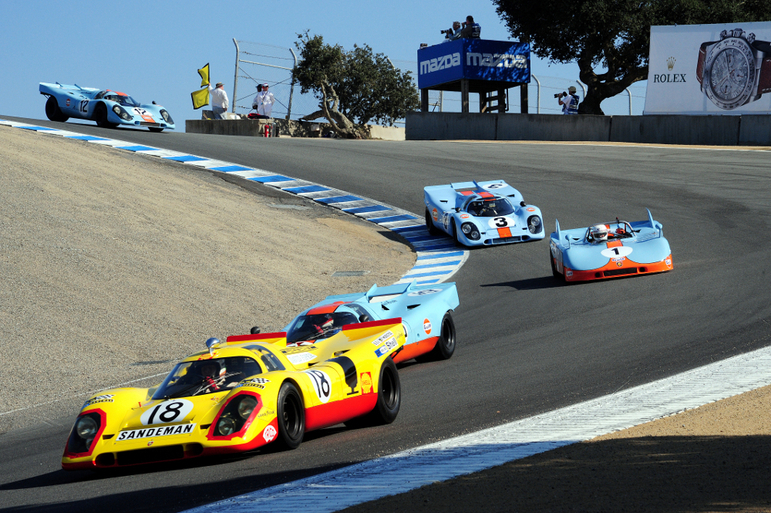 Additional details of the Porsche Rennsport Reunion IV ticket information is available by contacting 800-327-7322 or online at http://www.mazdaraceway.com. 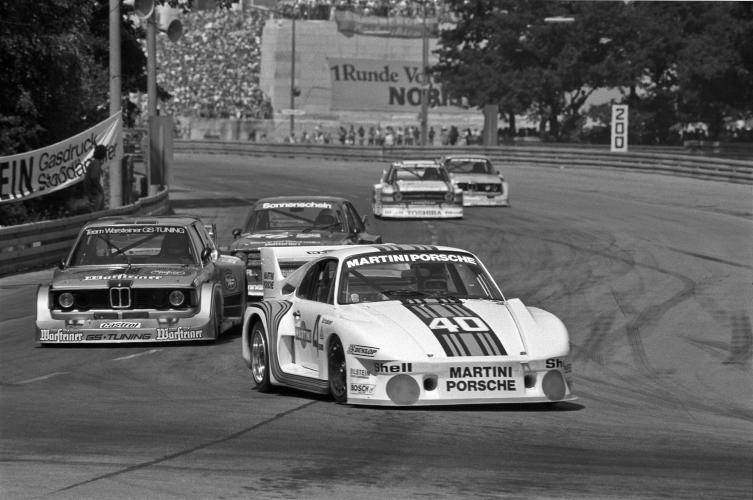 For more information on the Porsche Race Car Classic or to purchase tickets visit http://www.porscheracecarclassic.com. 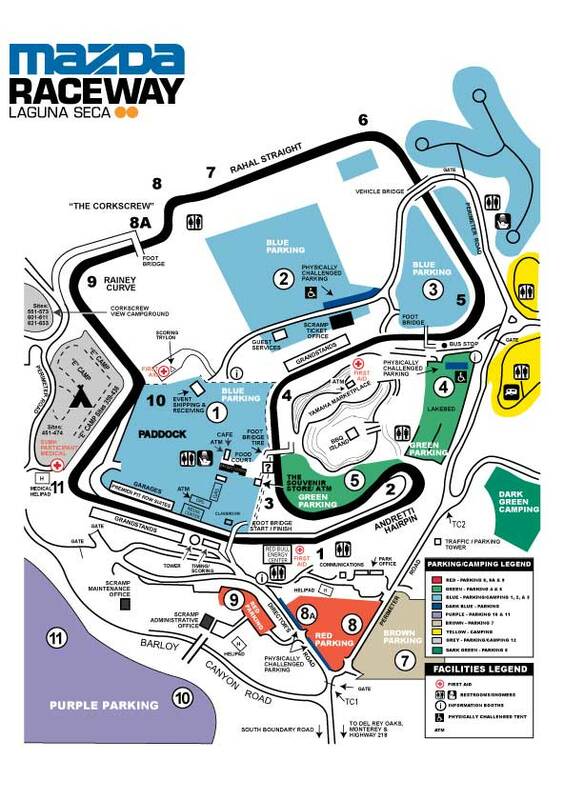 Porsche and Mazda Raceway Laguna Seca are working in association with the Porsche Race Car Classic to combine efforts to raise awareness for the Bonnie J. Addario Lung Cancer Foundation and the UCSF Thoracic Oncology Program. By the late 1950s it was obvious to Porsche that the 356, which was the company’s sole product line since 1948, needed to be updated. Replacing it was necessary, yet perilous. Who knew that the eventual replacement for the 356, the 911, would surpass its predecessor in sales, longevity and glory? Or that it would be so fanatically cherished by its owners that Porsche hasn’t been allowed to replace it. Or that the Company would be introducing its latest iteration all the way in 2011? From every angle it is unmistakably a 911, holding true to the Porsche 911 Carrera evolution, not revolution’ design philosophy. The new car has a longer wheel base, but is both lower and lighter than its predecessor. With its two engine sizes, the new 911 Carrera is able to provide improved performance and handling, and even better fuel economy than before. The 911 Carrera is equipped with a 3.4-liter, 350hp six-cylinder boxer engine, while the Carrera S is fitted with a 3.8-liter, 400hp six-cylinder boxer powerplant, both with the optional PDK transmission available. The new Porsche 911 Carrera celebrated its world premiere at the 2011 IAA Frankfurt Motor Show in September 2011, while the official North American debut will be held at the Los Angeles Auto Show in November. The first new 911 models will arrive in U.S. dealerships beginning in February of 2012. 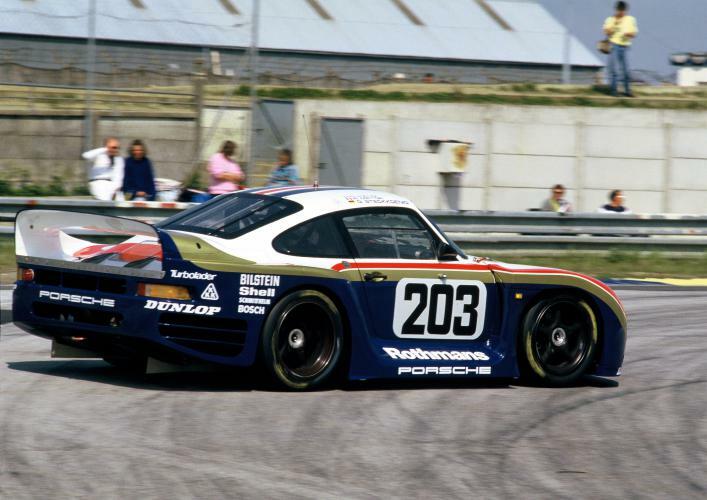 It took a while for Porsche Motorsport to warm up to the 911 as a race car, but, as has happened several times in the company’s history, the customers took the lead. Almost as soon as the 911 went into production, buyers were using it in hill climbs and autocrosses and Porsche itself started to produce lightweight and enhanced performance vehicles for their motorsports customers. In 1967, Porsche built 20 911 “R” models stripped interiors (no carpet, for instance), thin-skinned aluminum doors, fiberglass deck lids, taillights swiped from a Fiat, oversize carbs, a magnesium engine case, dual spark plug cylinder heads and much more. With about 210 horsepower on board, these race-ready, lightweight rockets were the start of the 911 racing legend. Anticipation for the first-ever West coast appearance of Porsche Rennsport Reunion IV October 14-16 at Mazda Raceway Laguna Seca is running high. Complementing the more than 350 of the rarest Porsche race cars competing on the track will be an unprecedented field of 800-plus Porsches staged in the traditional car corral area. The demand is so swift and the support from the Porsche Club of America so positive that an additional parking area with limited space is being designated as another Porsche car corral. An impressive lineup of Porsche race and sports cars, and what quite possibly will be the largest reunion of former and current Porsche drivers will be attending. More than 50 legendary drivers will be available for autograph sessions, mingling and plenty of story-telling of their days driving the now-legendary Porsche race cars. In addition to the already full Rennsport Reunion IV weekend at Mazda Raceway Laguna Seca, the Porsche Race Car Classic, an exclusive display of more than 180 of Porsche’s silver race cars from the 1950s and early ‘60s will be held on the lawns of the nearby Quail Lodge in Carmel on Sunday, October 16. Jacky Ickx at the wheel of the 1977 Porsche 935 “Baby,” which now resides at the Porsche Museum. More than 350 Porsche race cars have been accepted to participate in the on-track racing during Porsche Rennsport Reunion IV, October 14-16. They will tackle the historic 11-turn Mazda Raceway Laguna Seca, where many of these same cars once turned a wheel in anger during their professional racing day. Complementing the race cars in the paddock will be a very special display of approximately 50 Porsche race cars that will be showcased to Porsche fans, and each one has its own story. This includes cars from two very significant collections: the Porsche Museum in Stuttgart-Zuffenhausen, Germany, and The Revs Institute for Automotive Research at the Collier Collection in Naples, Florida.